Getting started on a low carb diet and unsure as to what’s safe for a snack and what’s not? No need to worry as I’ve put together a list of the Best Low Carb Fruits, Vegetables and Nuts for a Keto Diet! When you’re new to a low carb diet, some of the foods you have to avoid or limit are pretty obvious. It’s pretty clear that you need to avoid most starches such as bread, pasta, beans and potatoes. It’s also clear that most desserts are out of the question as well, considering most of them are starches as well and high in sugar content. But one thing most new low-carbers and those trying to live a keto lifestyle don’t often consider is the carb content of other foods such as vegetables, fruits and nuts. I mean, since they aren’t bready foods that means they’re safe, right? Well, not quite. That’s why I’ve put together this super convenient guide of the Best Low Carb Fruits, Vegetables and Nuts for a Keto Diet! 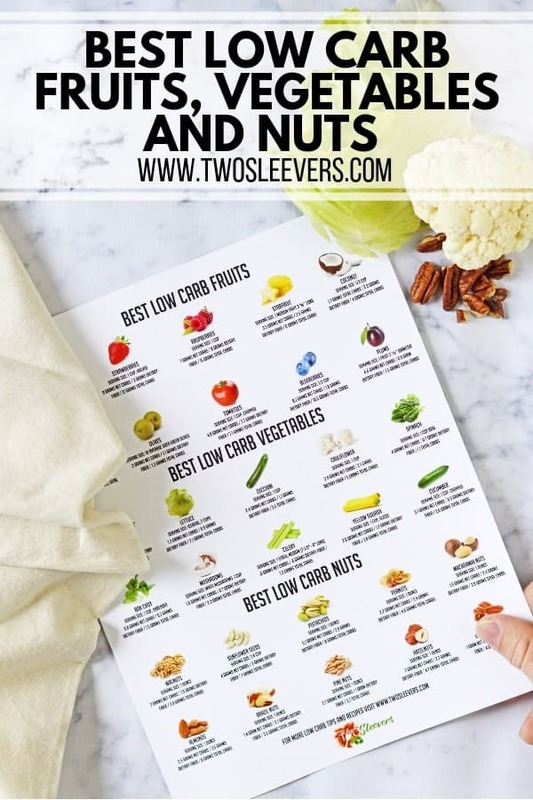 And to make things even more convenient, I’ve put together a fantastic printable list of all of the Best Low Carb Fruits, Vegetables and Nuts for quick reference. It’s perfect for sticking on the fridge or carrying with you to the grocery store when shopping for groceries for the week. Trust me, there’s nothing worse than getting back home from the grocery store with bags of stuff you thought was low carb only to find out you were sadly mistaken. I aim to take that possibility out of the equation with this nifty guide. NOTE: All of these fruits, vegetables and nuts have 9 grams of net carbs or less per serving, most of which have fewer than 3 net carbs per serving. It’s a common misconception that the sugar from fruits are good for you just because they come from fruits. Sadly, in the world of low carb and keto, sugar = carbs no matter what the source may be. But don’t fret, fruit isn’t completely off the menu. What fruits can I eat on a low carb diet? When it comes to choosing low carb fruits, berries are your safest bet. Now, just because they’re lower in carbs doesn’t mean you can eat all you want without reserve. They have to be eaten in moderation in order for you not to kick yourself out of ketosis. There are still quite a few other fruits you can enjoy on a low carb diet that aren’t berries. Plums, coconut, and star fruit are some safe, lower carb options that you can enjoy as a snack when trying to keep things low carb. What fruits can I eat on the keto diet? The fruits you can eat on a keto diet are going to be the same as a low carb diet. You’ll just want to make sure that you’re not exceeding your daily allowance for carb consumption and that you’re getting enough fat in your diet in order to get into ketosis. Are bananas Keto friendly? Are oranges Keto friendly? Though you can technically eat most anything on a keto diet as long as you eat in in moderation, the high carb content of bananas and fruits (23.9 and 11.9 net carbs per fruit respectively) keeps them from making the list of the best low carb fruits. There are many other better fruit options out there, and if you’re going to have fruit on your diet, you might as well have a fruit that you can eat more of in a single sitting. I’ve included some fruits on the list that aren’t typically considered fruits by most people. Though avocados, tomatoes, and olives may not look like fruits, they are actually classified as fruits. And since this is a list of the best low carb fruits, and these fruits happen to have some of the lowest carb content of all the fruit options out there, I decided to include them. You can also check out the complete list of the best low carb fruits (along with their carb content per serving) in this ultra convenient printable list HERE. Vegetables are definitely going to be one of your go-to foods for a low carb diet. They can be used as a side, an appetizer, a snack, or they can even be transformed into something completely different like this delicious Cauliflower Breadsticks recipe! Your lowest carb vegetable options are going to be your leafy green vegetables such as lettuce, spinach and bok choy. Leafy green vegetables can be used to make a wrap in place of bread in a sandwich, or they can be used as a great alternative to otherwise carb rich ingredients. I used Bok Choy in place of noodles in the delicious Low Carb Szechuan Pork Soup and it turned out amazing! 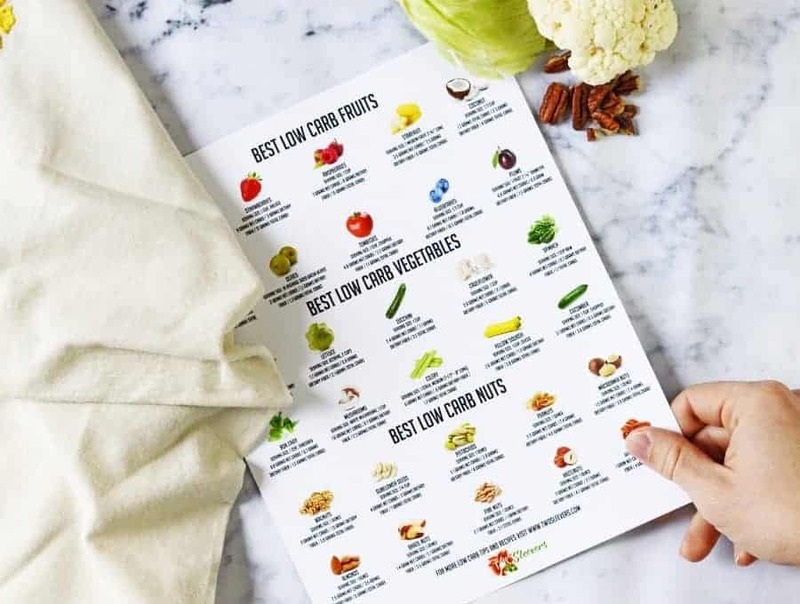 You can see the full list of the Best Low Carb Vegetables (and their carb content per serving) in this ultra convenient printable list right HERE. There are few snacks as incredibly convenient as nuts when on a low carb diet. They’re naturally snack sized, easy to carry around in a small zip lock bag for a quick craving cruncher, have a long shelf life with no need to refrigerate them, and are wonderfully low in carb content. Now, not all nuts are created equal in the world of low carb foods. Some nuts are exceptionally low carb, such as pecans, macadamia nuts and Brazil nuts, all of which have less than 2 net carbs per one ounce serving. Others, such as pistachios, cashews and soy nuts, can be a little higher in carb content and should be eaten in moderation. Not only can nuts be used as a super portable, ultra convenient snack, but they can be used as an alternative to higher carb ingredients as well! They can be used as a breading substitute to make some of the best breaded chicken you’ve ever had! Don’t believe me? Check out this delectable Pecan Chicken Tenders recipe! You can see the full list of the Best Low Carb Nuts (and their carb content per serving) in this ultra convenient printable list right HERE. 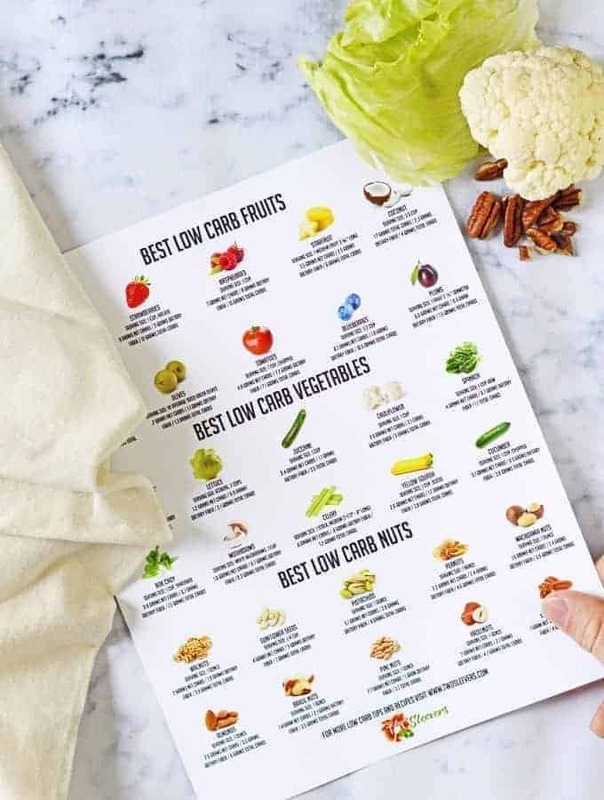 So there you have it, a comprehensive list of the best low carb fruits, vegetables and nuts all compiled in one great printable! If you’ve found this list convenient, enlightening, insightful, or helpful in any other way, let me know in the comments!